Looking for a land contract or rent to own? As a Realtor in the Madison area, I often have people contact me that are looking for a land contract or rent-to-own possibility (hereafter referred to as LC). Since I have received this question recently, I thought I would explore my thoughts on the topic, as well as some of the pros and cons from various perspectives. Why would anyone want do a land contract or rent to own? From the seller's perspective - At the core of this type of agreement is essentially a seller financed transaction for the buyer. As a home seller, you might consider a LC if you want to sell your home. This could be an attractive option if you know that traditional bank financing might be challenging for the buyer. On the one hand, this is good because you can open up your home to more potential home buyers and ideally get a better price for your home sale. On the other hand, would you really want to make a loan to someone that could not get approved by a regular bank? In most single family and condominium transactions, there is still plenty of money available at traditional banks for those with a decent credit score and stable debt to income ratios. But let's say that you own a condo without majority of the units sold to owner occupants, then you might consider a LC and offering terms that a buyer could not find on their own. Or if you are trying to sell a business or commercial property that seems risky to banks, you might consider a LC. Or if you are simply trying to make a return on your equity, you might consider a LC to receive a guaranteed return on your money rather than placing in an alternative investment. As a home seller you will probably need permission from your current mortgage holder or need to own the property free and clear. From the buyer's perspective - Again, this is essentially a seller financed transaction and likely seems attractive if you have a low credit score or can't qualify for a traditional bank mortgage. At the time of this writing, a minimum of 620 is the score needed to qualify for an FHA mortgage. If you want to buy a new home, but have a lower score, then you might consider finding a willing seller for a LC. However, one challenge that you might run into is that there's not a readily available list of homes that say, "I would do a land contract or rent-to-own". Thus, as a buyer, you are often left to search homes that are either "for sale" or "for rent" and then individually ask if a LC is a possibility. Another suggestion would be to check with a good loan officer or financial planner to discuss ways to improve your credit score and financial status. Often times credit scores can be greatly improved within a matter of a few months. If you do find a property with a seller willing to do a LC, then remember the final terms of these are all totally negotiable. The seller might want 5% down or 50% down. Since there's not a huge market for these types of deals, there's really not a strong incentive for the seller to offer the best financing terms. From a real estate agent's perspective - Final terms of any land contract must be drafted by an attorney in the State of Wisconsin and hence, most Realtor's will not be involved in a LC. In my experience, most homeowners either want to sell or rent. 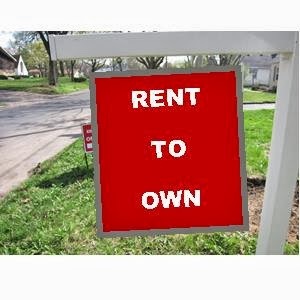 Rent to own might be a possibility, but only if the seller has permission from their current bank or the seller owns the property free and clear. My suggestion is to either make a decision to rent (accept the current position you're in), or to buy (improve your current credit and financial position in order to qualify for a conventional mortgage). Finding a LC will probably be more of a challenge than you realize. Want to chat more about the real estate market around Madison Wisconsin. Write your comments below or give us a call - 608-620-4234.